Communicative Health Care Associates (CHCA) specializes in comprehensive speech-language diagnostic and therapy services. We also provide services in accent reduction, coaching for public speaking, hearing screenings, and instruction in American Sign Language. Through our Allied Rehabilitation Associates (ARA) division, we offer full, multidisciplinary rehabilitation services including speech, physical and occupational therapies. We address the needs of different populations diverse in age and setting, and are highly attuned and sensitive to each client’s specific situation. Our staff is responsive to client time and format preferences; accordingly, we schedule individual daytime or small group sessions. We work closely with each client, the family and the primary care physician to ensure the best possible outcome. CHCA is a provider in Harvard Pilgrim Health Care, Neighborhood Health Plan and the Commonwealth’s Medical Assistance Program. We encourage you to contact us to learn more about our practice and how we can help you. 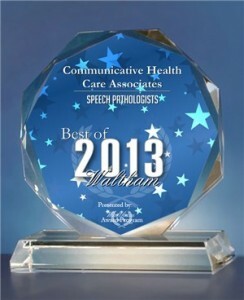 Communicative Health Care Associates was selected for the 2013 Best of Waltham Award in the Speech Pathologists category by the Waltham Award Program for the second consecutive year. The Waltham Award Program identifies companies that they believe have achieved exceptional marketing success in their local community and business category. These are local companies that enhance the positive image of small business through service to their customers and our community. The Waltham Award Program was established to recognize the best of local businesses in our community. The organization works with local business owners, trade groups, professional associations and other business advertising and marketing groups. Their mission is to recognize the small business community’s contributions to the U.S. economy.